I love an easy to throw together breakfast idea. My husband belongs to an Exchange Club here in St. George, Utah where they have a breakfast every Thursday morning. Well, it used to be catered by a local woman and she made amazing breakfasts for the group every week. One morning after his weekly meeting, Mark brought home a spinach quiche the size you can pick up and take with you. I didn’t dare ask “what’s the recipe”…since the woman does this for a living. I could tell it was probably a crescent roll placed in a muffin tin with spinach, cream cheese, cheese and eggs of course. Yep, I went to work and came up with this recipe. This recipe is easy peasy, and you can even eat them cold as you run out to the car for errands or school. You can make these with different cheeses, I used Mozzarella. I don’t usually buy those canned croissants, but I just had to try them when I made these. 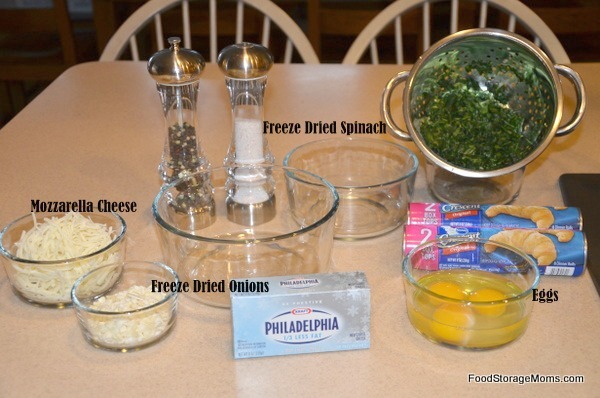 With this recipe, you can use freeze-dried, fresh or frozen spinach. You will just thaw the frozen and drain it, or rehydrate the freeze-dried spinach. I recently ate at a little hole in the wall cafe in a small town called LaVerkin, Utah. It was the cutest place to eat breakfast or lunch! I had a spinach, cheese and egg quiche in an egg roll wrapper. It was fabulous. 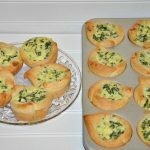 You would put the egg roll wrapper in the muffin tin add the egg mixture and bake if you were to make these at home. I have decided I need to get out and explore more of Southern Utah’s small mom and pop cafes. The fun part about many of these small establishments is that their food is much like you would make in your own kitchen. My husband has a lunch each month with some buddies in the neighborhood. They go to a small restaurant in downtown St. George, UT. They have a sign on the wall that says “Try Our Made At Home Desserts.” Yup, they bake them and then bring them to the cafe to serve customers. Their breakfasts are just like you and I would serve to family or friends when they come over for a visit. Don’t you just love to have guests over for a meal, particularly one based on the ingredients as easy as this Quiche recipe? Fix these for a few friends and you’ll be surprised how many new friends you’ll have to suggest a fun get together. *I used freeze-dried spinach, rehydrated and drained. I also used freeze-dried onions rehydrated and drained in today’s recipe. Gotta love food storage in the pantry! 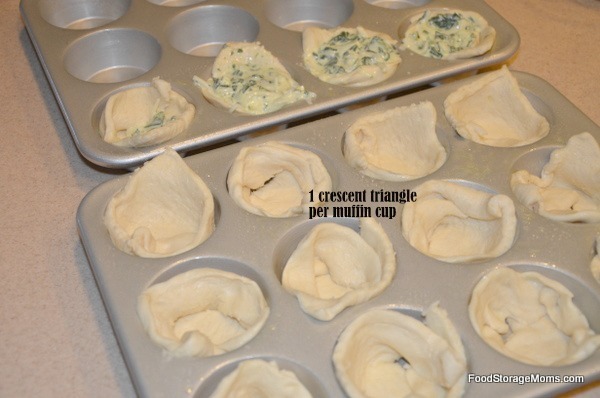 Spray the muffin tins with your favorite vegetable spray and then place a crescent triangle in the muffin cup starting at the bottom and making part of it go up the sides as much as you can to make a cup to fill with egg mixture. In a bowl beat the eggs, add the cream cheese, onions, spinach, and cheese. Salt and pepper to taste. Fill the muffin cups, be careful not to overfill them. Bake at 350 degrees for 17-22 minutes. Please do the toothpick or knife test to make sure they are done. This makes 16 muffin cups. 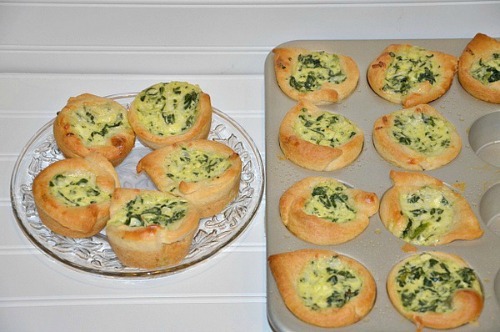 Remove from muffin tin and serve. They are good cold the next day as well! Plus another bonus these quiches freeze very well! Sounds wonderful, Linda. I’m going to try it when my kids come to visit. Thanks for the recipe. 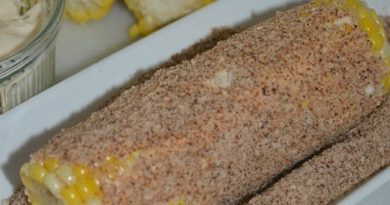 Another recipe of yours I need to make! Thank you so much. 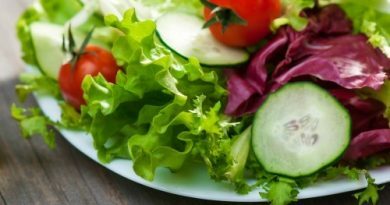 Love your blog and all the great info and recipes! 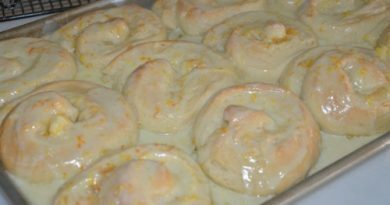 I’m always looking for new breakfast recipes and this one looks great! One thing – I primarily use my ipad to read your blog but It’s a bit difficult because I can’t stretch/enlarge the type. Is there a way I can enlarge it on my ipad? My “mature” eyes would appreciate it! Thanks!